What else should be expected from the DNC at this point? Covering up the true medical ailments and health conditions of Hillary Clinton has become a full-time job. Even bigger than countering the many inconvenient truths uttered by Donald Trump. The recent diagnosis of Pneumonia by Mrs. Clinton’s physician is surely an accurate one. However, what they neglected to tell the public is that this type of pneumonia is quite likely Aspiration pneumonia (AP), not Bacterial or Viral pneumonia. And “YES!” there is a HUGE difference between them. Aspiration pneumonia is by far the most common form that is experienced by Parkinson’s disease (PD) patients. 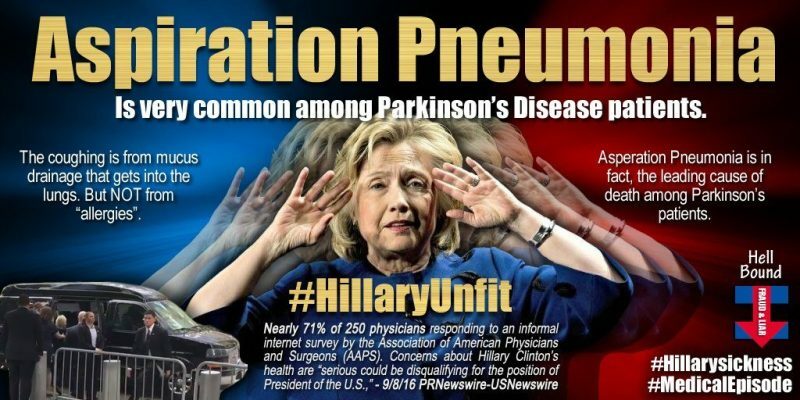 Mrs. Clinton has exhibited many of the classic symptoms of Parkinson’s and may have begun manifesting the disease as early as 2005. There are several pieces of evidence on the Internet which verify this little-known fact. The critical point here is that Aspiration pneumonia is a very common illness for bed-ridden PD patients, especially those who are hospital inpatients. Because Mrs. Clinton is currently taking a powerful regimen of pharmaceutical medications to control the PD, she has stayed out of this predicament but that does not mean her PD is not at a very serious stage of advancement. In fact, physicians are beginning to weigh in on just how grave Mrs. Clinton’s condition really is. Some of them are doing this because they know that the inordinate stresses of conducting a presidential campaign can easily do her in. This campaign season has been full of dramatic health incidents like no other in American election history. And the MSM (mainstream media) has gone out of its way to conveniently accommodate those extraordinary medical events which have plagued Mrs. Clinton. The crucial point here is that her doctor has now confirmed that she has Pneumonia. This constitutes an important admission of another major symptom of her Parkinson’s disease. What makes this piece of data even more radioactive is that the attending physicians know exactly what is going on with Mrs. Clinton, yet they refuse to disclose the facts to the public. The MSM, of course, continues to play along with this very dangerous game of “Let’s Grossly Mislead the Electorate”. It is possible, although very unlikely, that Mrs. Clinton does have either bacterial or viral pneumonia. Certainly she is the most closely medically monitored candidate in U.S. history and, therefore, they would know her lab work down to the smallest and most insignificant result. Were it to be a contagious form of Pneumonia, the medical authorities would be obligated to quarantine her during the most infectious periods of her disease process. This has not been done as she is out in the public on a constant basis. When the Commander-in-Chief cannot even prevent herself from falling down on the ground, or keep herself from having interminable coughing fits, or control her head-bobbing and -nodding episodes, how pray tell, will she command the U.S. Armed Forces? Clearly there is only one alternative left for Mrs. Clinton. 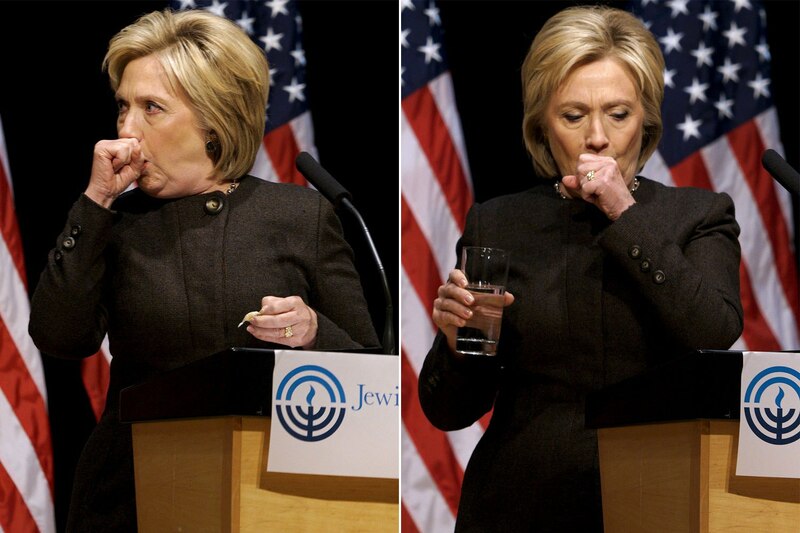 In light of yet another likely serious medical condition — Aspiration pneumonia — on top of all the other alarming symptoms that she has publicly displayed since the campaign began, she must withdraw from the race post haste. The DNC has an ethical imperative to inform the American people of the serious illness(es) which everyone has witnessed during prime time and remove her from contention immediately. Every day that goes by only puts Mrs. Clinton’s life at greater risk. As a matter of medical fact, the overwhelming pressures of this most tumultuous campaign season could EASILY kill her. Is that what the power-players at the DNC want? How about the big Democratic donors who have contributed millions to a very sick woman? Is this how the banking power-brokers really want to spend their money? BOMBSHELL Report: Hillary Clinton’s Nomination Will Be Terminated! A Physician Diagnosed Her With Parkinson’s! Her Presidential Aspirations Are Finished! The MSM Has Knowingly Deceived the American People! 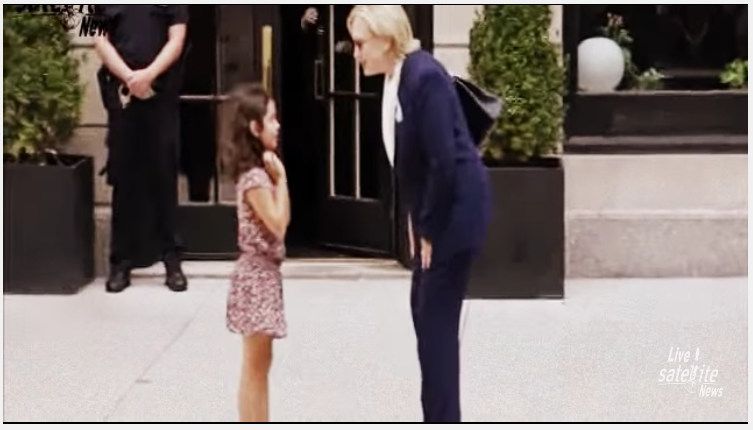 The following two photos of Mrs. Clinton with a young girl in front of her daughter’s NYC apartment on 9/11/16 clearly indicate that she does not have Bacterial or Viral pneumonia. 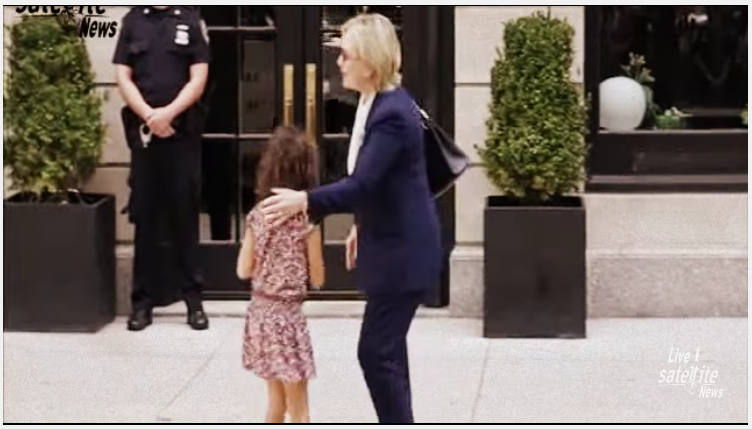 Her physicians would have done the public a terrible disservice by allowing Mrs. Clinton to a come so close to a vulnerable child. Hence, there is a very strong case that the type of pneumonia that she has contracted is Aspiration pneumonia, the kind that is usually suffered by those with Parkinson’s disease.